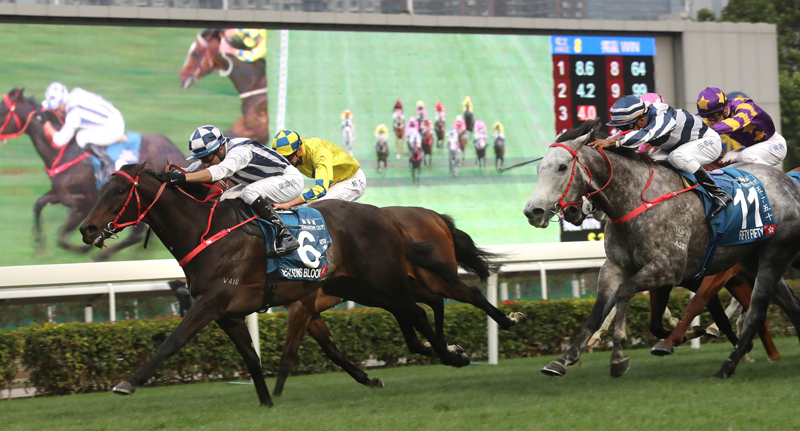 The Stewards' Cup dates back to 1954, when it was first run over 1200m at Happy Valley. The race's distance changed a number of times before it was relocated to Sha Tin in 1979, where it was run over 1400m. In 1991, the race became the mile contest which it is known as today, receiving HKG1 status and becoming the first leg of the newly-created Hong Kong Triple Crown. Since the turn of the century the Stewards' Cup has emerged as a world-class contest. Its roll-call of winners features superstars such as Able Friend, Good Ba Ba, Ambitious Dragon, Bullish Luck, Fairy King Prawn, Electronic Unicorn, and most recently, Seasons Bloom. It was upgraded to international Group 1 status for the first time in 2015, with prize money increased to the current level of HK$10 million. Danny Shum-trained Seasons Bloom (No. 6), with Joao Moreira on board, edges Fifty Fifty (No. 11) to win the 2018 Stewards’ Cup (1600m), the first leg of Triple Crown, at Sha Tin Racecourse.